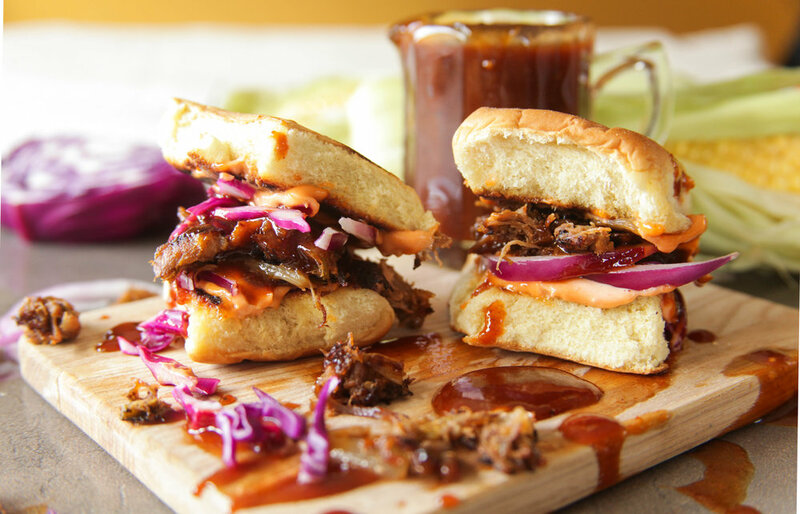 homemade barbecue sauce + my go-to pork sliders. my computer has been super weeeeird lately and i've had to update a lot of things. anyhoo, with my computer cooperating with me once again and summer fun times & house projects slowly winding down, i've found a bit more inspiration to get back to coming up with my own recipes. yay! 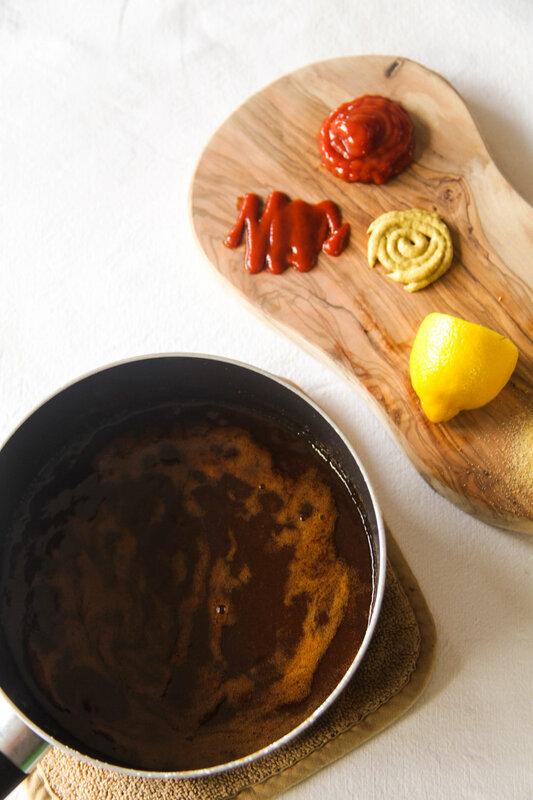 it's my durn-good homemade barbecue sauce recipe! i'm the type who doesn't normally choose bbq sauce as my dipping option, and i usually am not attracted to sandwiches with barbecue sauce. i just don't really care about barbecue sauce i guess. unless i'm at a legit bbq joint and they have 8 options to choose from. then i care deeply and have to try them all. i make my own because i like a good balance of savory + spicy + sweet + tangy. some barbecue sauces are just SWEET, bleh. some are thick and ultra savory. and the ones i avoid at all cost - smoky or chipotle flavored ones. heeeck nahhhh mannng. quinn + chipotle flavors = nope. so yeah, here's what i do to achieve a tangy, savory, sorta sweet, and nice & spicy barbecue sauce. i felt i couldn't just make barbecue sauce and take photos of it sitting in a jar or cup, so i made some delicious sliders to pair it with. for the sliders: hawaiian sweet rolls or whatever slider buns you prefer (ALWAYS toasted or crisped up in a pan with olive oil - crisping up your roll makes up like 75% of the slider's quality rating in my book), pulled pork (pete and i use this method for our pulled pork - crockpot + pork shoulder + thick-chopped yellow onions + one can beer + one can green salsa), sliced red onion, sriracha mayo (i just make this at home and keep a little jar handy for sandwiches, etc - about 1 cup of mayo + 3 TB sriracha, whisk whisk whisk), and thinly sliced red cabbage. i toss the cabbage in a little bowl with a splash of white vinegar and black pepper, just to take the cabbagey edge off the raw cabbage (read: cabbage is stinky). yum yum yum bout to gobble you up. these photos got real messy real fast. Finely mince a small amount of onion (fine enough so it is almost translucent - you want the onion to fully break down into the sauce after its finished simmering). I have also used dried minced onion and that works as well. Melt butter in a medium sauce pan over medium-low heat. Add minced onion and whisk to completely coat in melted butter. Add brown sugar and whisk to create a thick base. Increase heat to medium. Add the remaining ingredients into the pan, whisking as you go. Let it bubble and thicken on medium heat for a few minutes before simmering on medium-low heat for about 5 more minutes. Remove from heat and let cool. Store in glass jar or airtight container. Enjoy on sliders, with fries, on pizzas, chicken dishes, pork dishes, grilled vegetables, potatoes, etc, etc.